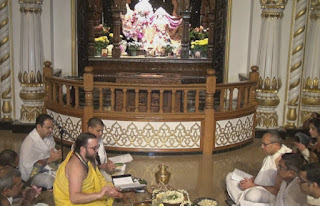 Video: Special Sunday Feast Fire Yajna ~ The Toronto Hare Krishna Temple! This past Sunday, we had a special "fire yajna" held during our Sunday Feast celebrations. A fire yajna is a ceremonial ritual wherein ghee (clarified butter), grains and other items are offered into fire amidst the chanting of mantras. It is a beautiful ritual that brings a level of auspiciousness and peacefulness to the atmosphere. The program was led by Brahma Muhurta das who was visiting from New York City and was in town to teach some of our local devotees about the art of conducting fire yajnas. The special Sunday Feast was video recorded. Check it out below.